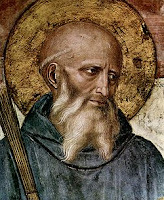 Over at Homiletic and Pastoral Review, an essay I wrote on St. Benedict is making the rounds on the usual Catholic news aggregators. Chesterton wrote that “it is the paradox of history that each generation is converted by the saint who contradicts it most.” He argues that this is the reason why the 19th century chose St. Francis of Assisi, and the 20th century chose St. Thomas Aquinas, as their contraries—or more rightly, the saints chose them, the times only thinking they have chosen these saints as patrons. The 19th century chose “the Franciscan romance precisely because it had neglected romance.” The 20th century chose St. Thomas, the master of reason, precisely because it had forgotten how to be reasonable. More than a decade into the 21st century—in the vast, universal, communion of saints—what saint will emerge as the help of his brethren who are still fighting for salvation? Who, besides Christ, can serve as our sign of contradiction for the post-modern world? “Any saint” might suffice as an answer, as our world desperately needs the witness of many saints— vastly different in a way that knights are different from monks, and complementary in a way that knights make excellent monks. However, by saying “any saint,” we fail to realize that not only is one age different from another—being set upon by its own trials and successes—but also each saint is different from another saint in his own trials and successes. Though there really is but one success: being a saint. That is, the 21st century has a craving for a specific saint, similar to a pregnant woman craving a specific, often odd pairing of food, like hot fudge covered pickles. Who will satisfy this craving; to whom will it give birth?